Compact, space-efficient combined case packer and palletizer in an innovative pharma design. Two packaging steps in one - automize your end-of-line packaging at the highest level. 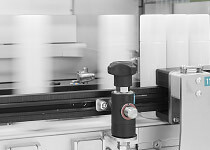 Experience fully automatic pharmaceutical packaging on a small footprint. The combined case packer and palletizer of the new Compact machine generation sets new standards: 35% space savings and 75% quicker changeover times. Boost your efficiency all along the line with two packaging steps in one: from the creation, filling and sealing of cases to their palletization. Trust in our cutting-edge top loading technology for the lowest life-cycle costs. The integrated architecture of this GMP design is the pharma production of the future. Diverse infeed systems and the wide format range ensure freedom for new packaging solutions.